Knowing that we will be leaving our house within the next 3 months has made me start to get rid of all the stuff that’s been stored in cupboards, under the stairs and in the garage for the last 24 years. Ebay, charity shops and the dump have already cleared a sizable amount of unwanted belongings. My paypal account has received over £1,300 in sales of books, CDs, DVDs, clothes and my kids old toys. Who’d have believed someone would pay £16 for an incomplete Subuteo set from 1989. We’ve recently made a decision to get rid of everything. If we’re going to be away for 5 or 6 years then it means storing our furniture and other stuff which will cost around £125 a month, and most is past it’s best before date anyhow. A simple calculation suggests that it will be better value to sell what we can and give away the rest. What we’ve saved in storage costs will mean we can start again whenever we return. It’s actually quite liberating to be less encumbered by belongings. As well as being part of the furniture, most of my books tell a story aside from the book narrative, as I usually try and leave a bookmark which reminds me what I was doing at the time of reading… so it might be a flight boarding pass, a receipt from a restaurant in another land and so on. It’s been interesting discovering these mementos… but as I haven’t bought a ‘paper’ book for a couple of years now, it’s been no problem seeing them go. This is what an Apostille looks like… each document has one of these stuck on the back and is impressed with the FoC stamp. Next is a visit to the Qatari Embassy. “Apostilles are used to legalise documents for use overseas. 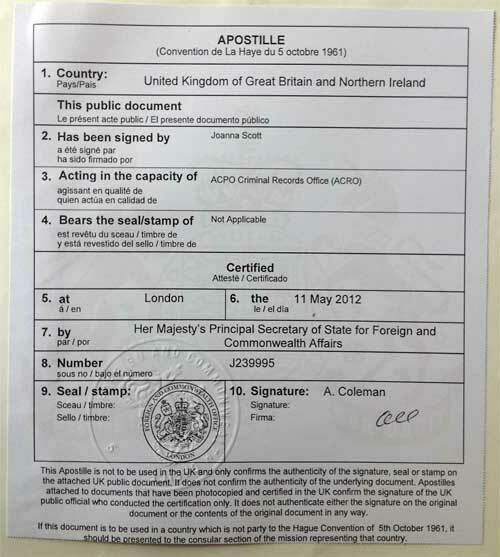 The apostille certificate confirms the document has been signed, sealed or stamped correctly”. This process has to be completed in order that my qualifications are recognised by the government of Qatar. This entails getting all relevant education certificates, that is the ones I listed on my application, verified as genuine. For this I must employ a Notary who will check and if OK, stamp and sign the certificates as genuine and charge a generous fee. An ACRO Police Certificate is also needed. I went for the cheap £35 10-day option but in hindsight I should have paid an additional £35 and got the 2-day turnaround. The next stage in the process will be to send the documents along with the Police and marriage certificates to the Legalisation Office at the Foreign and Commonwealth Office. They currently charge £30 to ‘legalise’ each document. Worth checking out the web page linked above which has underlines for headers in the right column. And then everything goes to the Embassy of Qatar in London… hopefully I will get this completed in the next two weeks. Until I actually arrive in Doha I am going to write about the various hoops that I have been jumping through as part of the recruitment process. I hope it will help anyone else who is, or will be exiting the UK for Qatar. Of course, once I am living and working in Doha, I intend to write about life in the Gulf. I was offered the job in January… it’s now May and I guess I am about two-thirds through the process. I am expecting to out there by the end of August… but let’s see. Tags: Doha, Expat, Qatar | Permalink.